Former Chair of the Corporation, College governor William Bagnall receives an MBE in recognition of his magnificent contribution over many years to post-16 education. William has served the College as a governor since 1996. In his time as Chair, William oversaw a period of significant and lasting change, taking responsibility for a multi-million pound investment in the site to develop the impressive facility enjoyed by so many young people today. On learning of his honour, William said: ‘I’m truly delighted with this award which came as a real surprise. Whilst in theory it is a public appreciation of my contribution to education over the last 21 years, in reality it’s not just about me. It’s a clear recognition of the success of this exceptional College and the great work undertaken by so many teachers, support staff and governors as well as the incredible leadership team headed firstly by John Guy and now Simon Jarvis. Everyone involved should rightly feel they own part of this honour. The opportunity for me to become a governor of the College happened by chance and wasn’t something I had envisaged. But I was immediately captivated by the absolute focus on the single objective to improve student achievements, by its essentially non-selective entry, by its great support for each student even as numbers grew and by the view that there is no reason it shouldn’t provide the best sixth form education in the country. The outcome is well known. Demand for a place at the College has grown from 1,200 to over 3,700 full time students taking A levels, the Estate has been transformed to provide the very best modern buildings and the College reputation has never been higher. It’s well recorded that our students leave here as high achievers and, as the mission statement says, equipped with skills needed to meet the demands of a changing world with confidence. My role here really has been the most satisfying thing I have done. It’s been challenging, it’s been fun and it’s been immensely rewarding to have been part of this great success story. 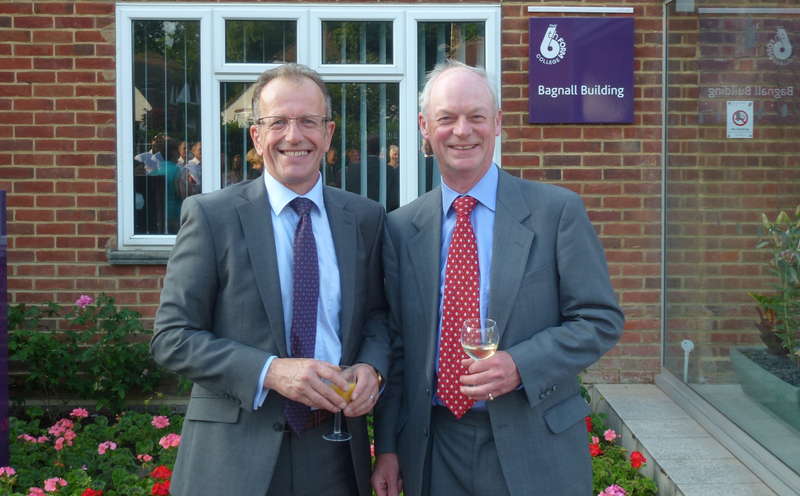 Principal Simon Jarvis commented: ‘If ever there was a worthy recipient of an honours award it is William Bagnall. He exemplifies everything good about voluntary public service. Many thousands of youngsters will be unaware of the extraordinary contribution made to their lives by William who has devoted so much of his energy, selflessly and unstintingly despite the many professional demands on his time, to improving the College.